In the US state of California, devastating wildfires are now simply a way of life for residents—and things will likely only get worse. Since the president’s solution for combating these climate change-fuelled disasters is to threaten to cut disaster relief funding for the state, local governments are taking matters into their own hands. The plan: Goat Fund Me. 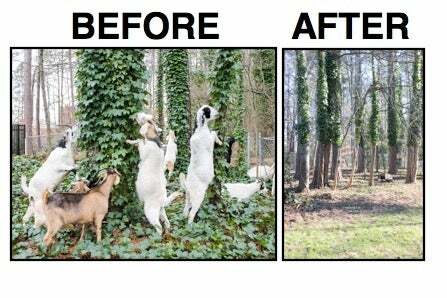 The tactic of using herds of goats to clear the flammable dry brush in forest areas has become increasingly popular. Now, the town of Nevada City, California, wants to deploy its own goat army to clean up its surrounding areas as soon as possible. Authorities in Nevada City are attempting to quickly subsidise their preventative measures through the power of crowdfunding and catchy branding. Goat Fund Me, a campaign launched by Nevada City Vice Mayor Reinette Senum, aims to raise $30,000 (£23,590) that will be used to bring in several large herds of hungry goats for the purpose of eating up the wild brush on city land. Though wildfires in California are becoming a year-round problem, the winter season remains the best time for Nevada City to prepare itself. “We can go out and pursue grants but that takes months, and we don’t have months,” Senum told Wired. Even at those costs, Nevada City isn’t looking to clear out all 450 acres of its city-owned greenbelt at once. It’s working with experts to target the areas that pose the greatest risk. And there’s plenty of risks. Nevada City is located about 80 miles from Paradise, California, where last season’s Camp Fire killed at least 38 people and levelled the majority of homes. That disaster is estimated to have resulted in around $16.5 billion (£13 billion) in losses for the region. With those kinds of numbers, $30,000 for some goats really starts to look like a bargain. Using 200 goats, Nevada City can clear around an acre of its land each day. All that’s needed is some solar-powered electric fencing to corral the goats into a specific area, a herdsman on hand to oversee the grazing, and a herding dog to ward off predators. Organisers try to locate areas that have nearby sources of water, but a water wagon is also used to help the goats wash that brush down. When the goats are done, humans also have a job to do. Chainsaw-wielding hand-crews come in and take care of the bigger tasks. And as city officials go around town for planning their targeted areas they also use the opportunity for community outreach—educating private property owners on best practices to take care of their own lands.